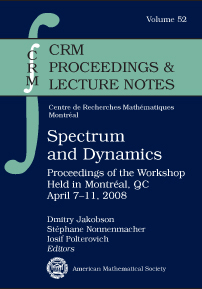 This volume contains a collection of papers presented at the workshop on Spectrum and Dynamics held at the CRM in April 2008. In recent years, many new exciting connections have been established between the spectral theory of elliptic operators and the theory of dynamical systems. A number of articles in the proceedings highlight these discoveries. The volume features a diversity of topics, such as quantum chaos, spectral geometry, semiclassical analysis, number theory and ergodic theory. Apart from the research papers aimed at the experts, this book includes several survey articles accessible to a broad mathematical audience. Graduate students and research mathematicians interested in PDEs on manifolds and dynamical systems with hyperbolic behavior.